I'm guessing that by now you've head the phrase, "I don't feel like 'Adulting' today". And y'all, I've just got admit, I don't like that statement. In fact, I really don't like it. 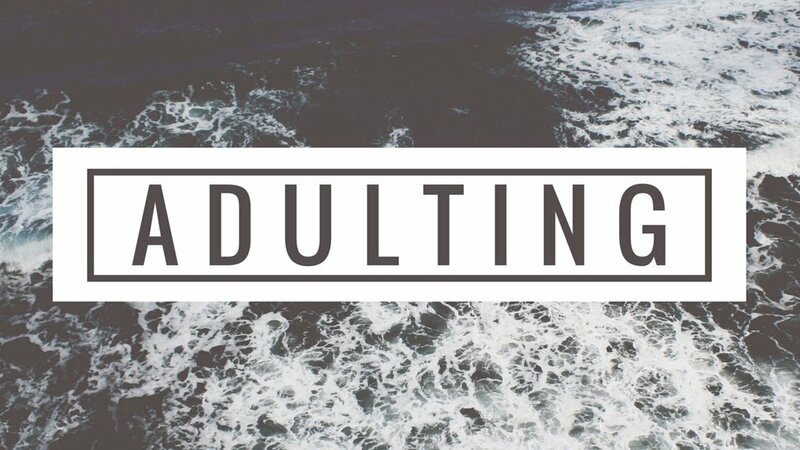 Personally, I feel like 'Adulting' every day. Despite their individual hardships, in my experience, each life stage has turned out to be better than the one before it. That's why I can't relate to the popular trend of complaining about being an adult. I love being an adult! Great big responsibilities included. I can remember being just a kid, probably in elementary school, and dreaming about being a grown up. I even went as far as drawing out a floor plan for an apartment, a road, and an office building, with chalk on our driveway. I used the neighbors big wheel as a car and pretended I had my own place, cooked my own food, and worked a job that provided for me. Of course, I played house and Indians and other imaginary games too, but this particular game was such a sign of my independence and zest for life! For me, college has been over longer than I was in it, which is really strange considering I spent so many years thinking of it as the pinnacle of life! It was a wonderful experience, but not quite the pinnacle of life. That's how I felt about high school too. I loved it while I was in it, but would definitely not refer to it as my "glory days" as is common to do. Now, as an actual adult, I realize how much I was idealizing this life stage as I grew up. As a youngster, I couldn't possibly know what it meant to craft a resume, sweat through job interviews, pray to be hired, try to make friends after college, navigate the dating world, learn how to be married, commit to a budget, etc. However, now that I have spent time developing all those skills and living up to those responsibilities, I can confidently say, that being an adult is really great. Here are a few reasons why you won't catch the phrase, "I can't adult today", rolling off my tongue. I am still alive. I like being alive. Thanks to Jesus, after this life I have eternal life to look forward to, but that doesn't keep me from making the most of my earthly life. Also, I have a lot to look forward to: watching my children grow up, ministering to those God places in my life, growing old with Matthew, etc. I'm so thankful to have lived to Adulthood and I hope I live well into the elderly years too! Life on earth is short and I hope to enjoy every second. I have overcome obstacles. I wasn't born an adult. I had to live a lot to get here. I've been given beautiful experiences and painful ones as well. I have learned a lot and am still learning so much! The obstacles that I have worked through in life have made me who I am and made me a better me than who I was. The more time I spend on Earth, the more God is molding me into who He intended me to be all along and the more I know and love Him. I get to glorify God. Which, is the reason I am alive in the first place! As an adult, I get to live out my unique calling, in my unique circumstances, to the glory of God. And so do you! This is exciting to me. In the past, God placed me in Young Life, Women's Bible studies, etc., and now, I think it's my role as wife and mother that I can most glorify Him, but whatever He has in store for me as an adult, I pray I do it to His glory. The easy things and the hard things, especially the hard things, are opportunities for me to point others to Christ. To this end we always pray for you, that our God may make you worthy of His calling and may fulfill every resolve for good and every work of faith by His power, so that the name of our Lord Jesus may be glorified in you, and you in Him, according to the grace of our Lord Jesus Christ. I am a spoiled American. "Adulting" probably is really hard if you live in a third world country where war, disease, and hunger threaten your life and the lives of your loved ones every day. In the southern part of the United States however, "adulting" often simply refers to paying bills to keep your electricity and water on, making enough money to fuel a Starbucks addiction, or having enough cash in the bank to buy a dog you don't really need. The truth is, we have it made folks. There's no getting around it. There are truly difficult things that occur in life, being an American adult is not one of them. I am living with a grateful heart. My possessions, my profession, and my people are all gifts. Every last thing I love or cling to is a gift straight from God. As a sinner I deserve none of it. But because Christ shed His blood for me, I am a daughter of God and he loves to give me good things. With this in mind, I can live out every day in praise and thankfulness that I have what I have and do what I do. I can be thankful for dirty dishes because it means I have plenty of food to eat. I can be thankful for a budget and spending limits because it means I have money in the bank. I can be thankful I have dirty floors because it means I have loved ones who visit. I can be thankful there's another load of laundry to fold because it means I have a husband and son whom I adore. "Adulting" isn't hard when you are looking at life through the lens of gratitude. Maybe you think I'm taking a hashtag too seriously, but I disagree. Everything we do in life matters, even our hashtags. If we aren't consciously making decisions about our actions, we will get swept along into the flow of the masses, into the crowd, when we, as Christ followers, should be different than the crowd (John 17:16).